Fresh Red and juicy! Whipped cream is extra. 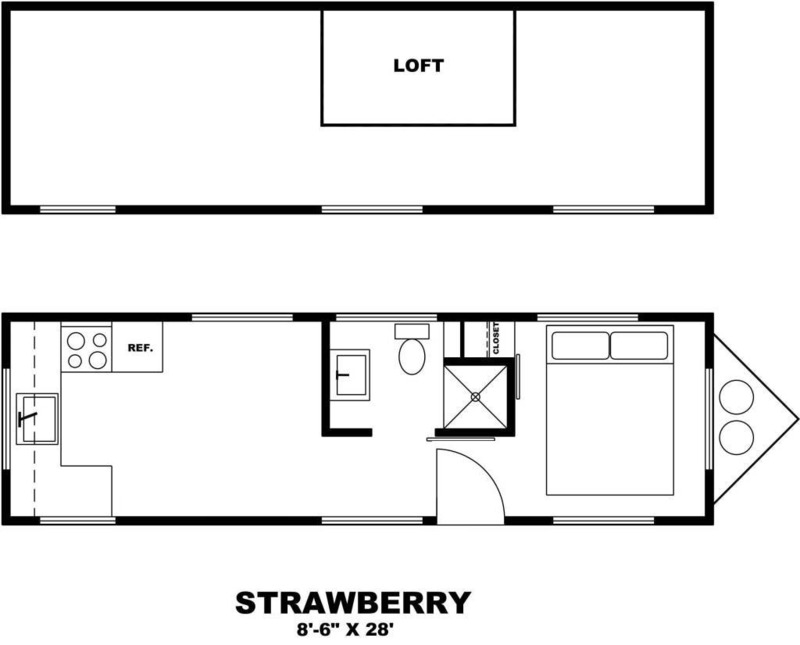 The Strawberry, Penny’s big sister and another collaboration with Cheeky Monkey Tiny Houses, is 8.5’ wide by 28’ long and 11’ high. Very easy to pull. Low profile yet still 238sq. feet plus another 60 sq. feet of loft storage. The private main floor bedroom fits a queen size bed and a closet or a King one side access and a closet. No stairs or ladders to deal with late at night. The Strawberry can sleep 4 comfortably with the pull out couch. Cook full course meals in your full size kitchen. Then kick back on your love seat and watch your favorite film. Spacious bathroom with dual or single sinks. You can even put in a W/D and dish washer. Lots of light with 11 dual pane low E windows and full light door. Great for everyday living or as a getaway cabin for two and some friends!